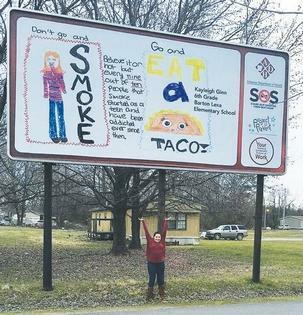 Kayleigh Ginn is the Barton-Lexa School District’s winner of the Tobacco Prevention and Cessation Program’s Billboard Design Contest. The contest was designed to encourage and educate the communities in Phillips, Lee and St. Francis counties about tobacco prevention through the eyes of young people. Stacey Morris, community engagement coordinator for the program in the three participating counties, worked with local art teachers in the Barton-Lexa, Palestine-Wheatley and the Anna Strong Middle School in Marianna. Three winners were selected, one from each school and their designs were placed on a billboard in their respective counties.